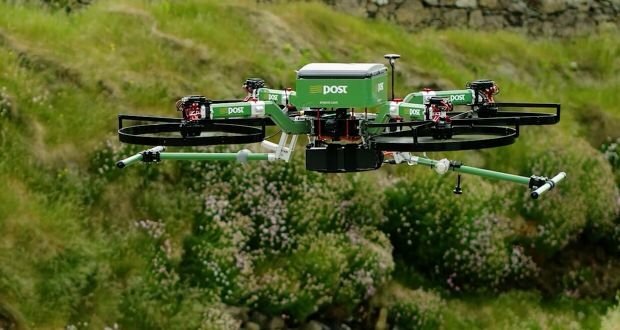 PostBOT is an all-weather, ground-based drone that will accompany postal workers along their delivery routes. It can carry up to 150 kg (330 lb) of mail and packages. The robot was designed with considerable input from Deutsche Post personnel and was built by the French company Effidence which won the DHL Robotics Challenge last year. The main goal of this mail-toting machine is to ease the physical challenge of the job even as the postal workers continue to age. The current version of PostBOT is 150 cm (4 ft 11 inches) tall and can travel at speeds of up to 6 km/h (3.7 mph). In case you are wondering how the four-wheeled mail delivery bot will handle steps, well, according to The Postal Hub there are no steps in Bad Hersfeld where the six week trial is set to begin later this year. It will be interesting to see how PostBOT will interact with the Parcelcopter, DHL’s tiltwing delivery drone.